Due to NCAA sanctions, the Texas State University Fightin' Armadillos must form a football team from their actual student body, with no scholarships to help, to play their football schedule. Pete Bell: Boys, the rules don't make much sense. But I believe in the rules. Some of us broke them. I broke them. I can't do this. I can't win like this. While the story was rather interesting, it seemed like it was too sensationalized for it own good. Unfortunately, in a movie about basketball players, one cannot find 7-foot actors, which meant Shaq O'Neal was one of the few people who could fill the role. This entire film tries to hard, accentuating points too harshly, and showing how corrupt the entire system in a manner that doesn't appear believable. 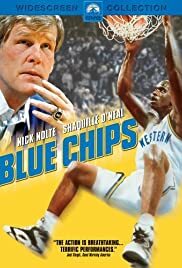 I will say this, Nick Nolte really embodies the uber-Bobby Knight character, and what happened to Matt Nover? He was clearly the only good actor amongst all of the basketball players in the film.